Pipe bending with mandrel from Ø15 - Ø508 mm. GMF A/S is among Europe’s leading companies in the field of cold pipe bending with mandrel. GMF A/S is ISO 9001-certified: 2008 certification via Dancert A/S. We have an experienced staff capable of executing any project quickly and professionally. We handle batch productions, as well as one-off productions. We are always ready for a new challenge. We will give you an estimate, and we can assist with all relevant information and details. 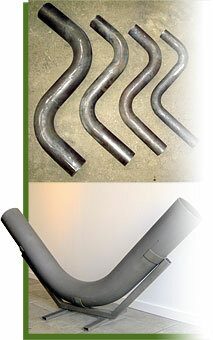 Our standard programme includes pipe elbows and elbows with one or more bends. We work with customers that use bent piping and tubing in many different applications, e.g with high-pressure, large temperature fluctuations, aggressive liquids and harsh weather conditions. Our focus is on quality, tolerances, durability, safety and delivery reliability. We work in compliance with EN10217-1, EN10217-2, EN10217-3, EN10217-7, EN10216-2, EN10216-3, EN10216-4, EN10216-5 in steel qualities according to EN, ASTM, AISI and ANSI standards. Production with customer-supplied materials is executed according to customer specifications. GMF A/S is ISO 9001-certified: 2015 certification via Dancert A/S.